The UK National Contact Point (NCP) for the OECD Guidelines for Multinational Enterprises (the Guidelines) has decided to allow the complaint from UK Lawyers for Israel and has stated that the issues raised by UKLFI “merit further examination”. The complaint was originally brought against PwC in December 2016 and it has taken the NCP 18 months to reach this initial assessment. The NCP, a Government body which promotes and enforces human rights standards for multinational corporations “decided to allow the complaint” made by UK Lawyers for Israel (“UKLFI”), an NGO which seeks to promote the proper application of laws in relation to Israel. The Government body’s initial assessment, released on 15 June 2018 here demonstrates that all auditors must pay attention to the human rights impact of the entities which they are auditing. Audits by Big Four companies are relied on by major donors, including the UK Government and the World Bank to ensure that taxpayer money is not being diverted to fund terrorism and other human rights abuses abroad. PwC’s audits of the PA are a case in point. The UK Government contributes around £67 million of tax payers’ money per year to the PA. Significant amounts of PA funds are paid to convicted terrorists in salaries and other benefits. Research shows that this incites further terrorism. PA payments to terrorists infringe the human rights of three groups: (i) victims of terrorist attacks; (ii) Palestinian Citizens; (iii) taxpayers in donor countries. 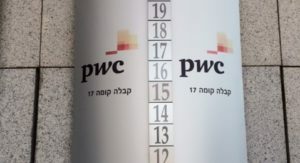 PwC appears to have failed to raise concerns about the PA spending aid money on salaries for terrorists and on glorifying terrorism. The PA’s payments to terrorists and their families encourages racial or nationalistic hatred and harms the peace process between Israel and the Palestinians. They curtail the establishment of flourishing Palestinian civil institutions and infringe the rights of Palestinian citizens to prudent governance. If auditors ignore, or fail to raise such issues, this can have the effect of facilitating terrorist activity. The Government body will formally ask both parties whether they are willing to engage in a mediation process, with the aim of agreeing how the issues identified can be successfully addressed. UKLFI is willing to engage in such a mediation and is eager to discuss how to bring PWC’s operations into compliance with the Guidelines and to ensure that PWC undertake actions to avoid and prevent future human rights infringements. The Organisation for Economic Co-operation and Development (“OECD”) created a set of Guidelines for Multinational Enterprises which set non-binding principles for responsible business. These include internationally-recognised standards for human rights, protection of the environment, the rights of workers, and combating bribery. Members of the OECD are required to maintain a complaint mechanism against companies which breach the Guidelines, for example by abusing human rights, their workers or the environment. The complaint mechanism is known as the National Contact Point (“NCP”). This complaint has been made to the UK’s NCP, which is part of the Department of International Trade. The NCP can recommend actions to the entity concerned, including that it change its behaviour and that it enter into a mediation with the complainant. If a complaint is upheld and the company fails to change its behaviour, the NCP can issue a final statement recording that the company has breached the Guidelines. In the past, a complaint to the UK’s NCP led to a mining company (SOCO) completely abandoning a mining project in the Congo which threatened a World Heritage Site.